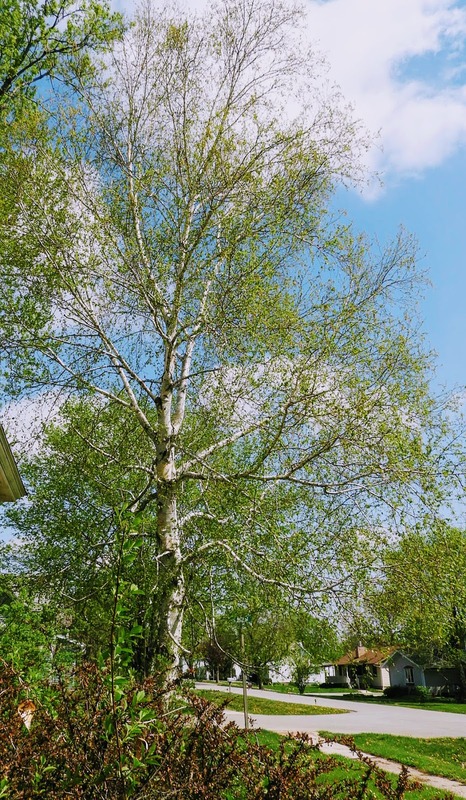 The old birch tree at the farm is glowing with the new growth and its bright white bark. It started out as a dark brown stick back in 1978 and has grown into this. I don’t know the life span of this kind of tree but I do know in the northern climates that they do die out when they live in a timber that crowds them out. The stick of the start of this tree came from a ditch on a gravel road. 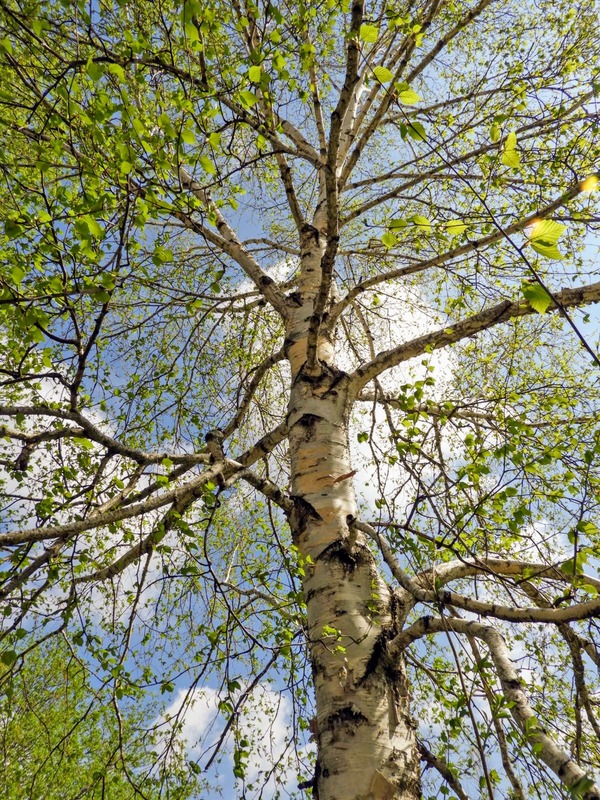 It doesn’t have white bark until it grows older. Most of that kind of stick gets eventually mowed down when they cut the grass and wild plants in the ditches. 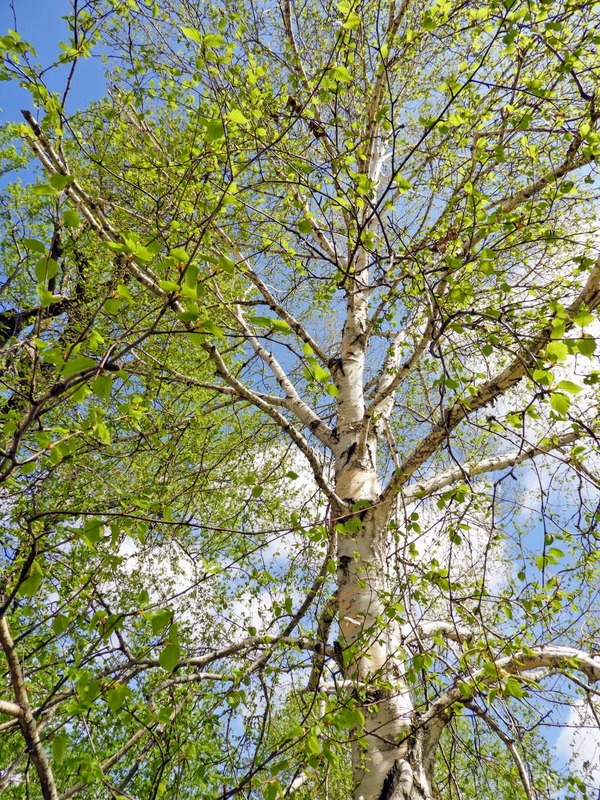 The Minnesota birch doesn’t shed its bark like the river birch. It does shed bark but not is a rapid rate each year. 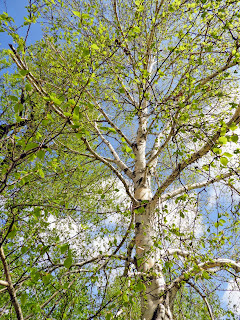 When I was a kid traveling west with family in the summers, I remember seeing the little birch bark canoes sold in gift shops. The canoe would be held together with laced seams of natural cording. The clouds were perfect last Wednesday when I was there to mow the grass. It was a warm day and I was down to a T-shirt as it was too warm for anything else. Today, here at home, we are back to having cold air with rain. We had a very hard rainstorm last night with lots of lighting and thunder. It was at 2:00 am as I had to sit on the floor with Barney to comfort him. His hearing hasn’t failed so he knows we are getting a storm. At one time I could hear sporadic times of hail but it wasn’t the kind that destroys plants. 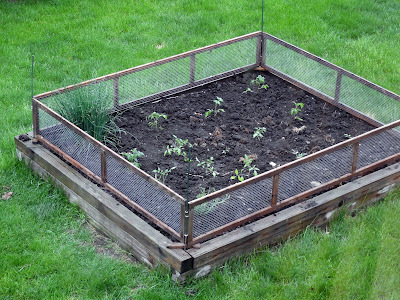 I looked out this morning and all my tomato plants seem to be intact. I have seen hail strip the leaves from tomato plants but it was good news to see all of them standing straight and are still green. I planted these on Thursday, last week, and they seem to be doing great. I have the chives growing strong and an added lavender plant sits opposite it in the corner The former owner was prepared with these screens for hungry critters but I think the raised bed already makes it safe from them. The birds do like to land on the wire guards. The neighbors plant radishes and lettuce and I could see how they would be tempting for vegetarians. I see the one rabbit enjoying the lush green grass but I am sure he would like some lettuce. I never really took a good photo of this bird. He would either hang on the other side of the sock or he would be moving continually. 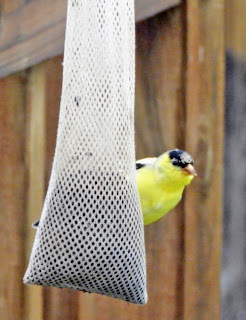 I am only seeing the one pair now at the feeder so all those other goldfinches have moved on probably flying further north. I am going to keep the seed filled as I have photo evidence from last year of the pair bringing there hatchlings to the feeder to get a meal. We are staying close to home today for Barney’s sake of an impending rain storms again. It is suppose to let up closer to the noon time so we will venture to the bookstore at a later time. We are gray with overcast skies and the sun has not been seen yet today. Hopefully we will see sunshine by this afternoon. I wish you all to have a great day. Birch trees are one of my favorites, that silvery bark is magical, especially with an up-light at night.